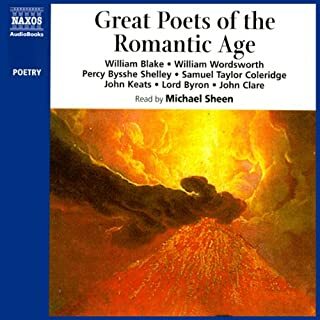 ©1998 NAXOS AudioBooks Ltd. (P)1998 NAXOS AudioBooks Ltd.
Poetic delight. Lyric ecstasy. Personally, it's the best collection of poems ever. Should you have any doubts about that, look at the list of poems and the narrators. I really loved this disc, which was originally recorded as a tribute to the life of Princess Di. 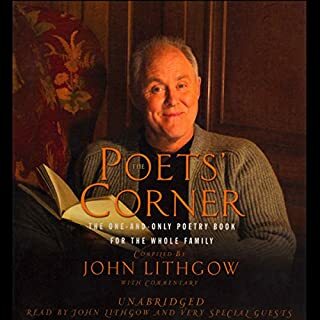 The readings are incredible, and my favorite was John Cleese's reading of Owl & The Pussycat. The poetry selections are perfect to follow the line of Shakespeare's ages of man and the readers were wonderfully chosen. High recommend. It is really hard to go back to a specific poem with no index. It lessens the enjoyability since you have to guess if you want to go back to the beginning of a poem. 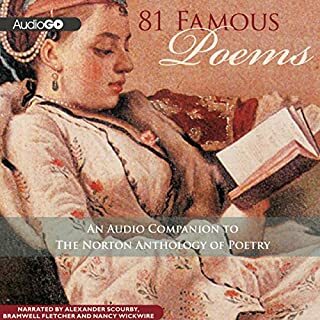 I wish there was a Whispersync for Voice book so than it would be possible to read and listen to the poems in the same time. This is a wonderful collection of poetry about the stages of life and death. Many of the poems are classics, but some are unfamiliar. They are all read by different narrators who use expression and skill. Highly recommended for anyone looking for some good soul moving poetry. 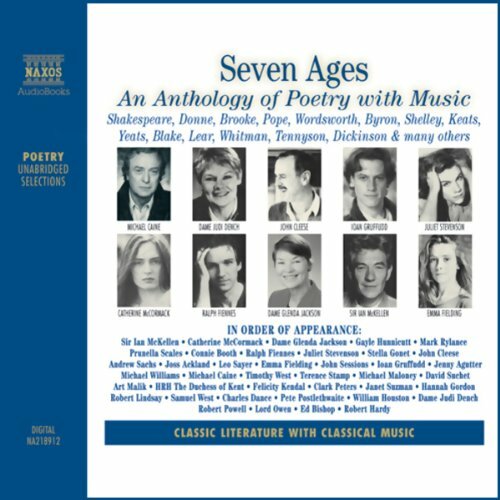 I'd just like to note that there is no real story: this compilation takes us through the seven ages of man as defined in a famous speech in Shakespeare's comedy "As You Like It". The recording includes many old favourites of mine, but has also introduced me to others that have instantly appealed. Some are beautiful and/or thought-provoking; others are just downright hilarious (e.g. Ogden Nash's "Peekaboo"). Most of the readers are excellent; there are only two or three tracks where I found the recitation irritating. I want particularly to mention Michael Caine, not usually known for his poetry readings: here he reads the classic "If" (Kipling) with complete conviction and seriousness and then goes on to give us the cheeky "The b---in' Sparrer". Superb, too, are Ioann Gruffudd's readings of Welsh poetry. 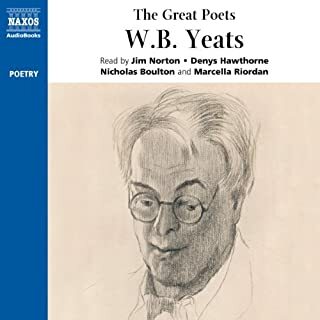 My only beef if that, while each narrator gives the name of the poem and its author before each reading, there is no written list available to the purchaser of the recording, nor any indication of who is reading what. You can try to enlarge the cover photograph, but several people read more than one poem and not all the voices are easily identifiable. Maybe a lot of people don't care about that, but I enjoy knowing who each narrator is. Anyway, highly recommended: I'll be listening to this more than once. Performance vary by narrator. Some are good (e.g. Ian Mckellen) while some are unexpectedly disappointing. No, this is a book that you want to absorb in stages. I wish there's an option to replay a specific section over and over again or to skip to a specific poem. What I ended up doing was making separate notes at the beginning of each poem so that I could skip to that part. 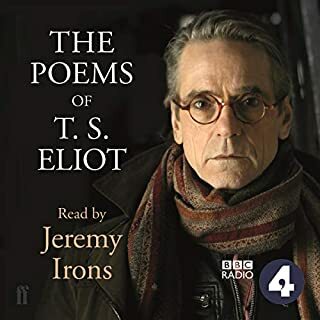 Some of the best of English and American poetry, read by some of the outstanding actors of our time. 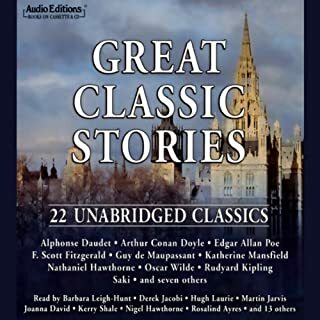 I especially loved Ian McKellan, Michael Caine and above all John Cleese - his renditions of "The Owl and the Pussycat" and especially "The Road Not Taken" (at 2:04:47) alone make this a worthwhile purchase. My only complaint is that one or two of the poems have special effects (an echo) which are not needed, and distract from what would otherwise be excellent readings. I was really not expecting so many favouites so well read. Some not read or heard in many years. Even if you are not so interested in the Seven Ages aspect, this is a very good selection. Thanks reviewer 'ESK' , for the list. What does Ralph Fiennes and Dame Judi Dench bring to the story that you wouldn’t experience if you just read the book?